The Ransomes Overgreen was designed specifically to cut golf greens and other sporting surfaces. It was produced from the 1950s onwards and has been used throughout the world. The Overgreen comprised a tractor unit and three fine-cut cylinder mowers. One of these was slung between the wheels of the tractor unit while the other two were towed behind. The "VEE" shape formed by the group of mowers enabled a wide cut for each pass across the lawn or green, making it easy to cut large areas much more quickly than with conventional hand operated or powered machines. According to Ransomes' own advertisements one man and an Overgreen could cut all eighteen greens on a golf course in a single day. The combination of odd numbers (three, five or seven) of small units into a larger assembly is known as a gang mower. 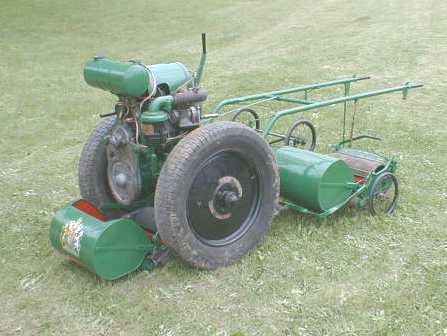 Most examples are pulled by a tractor but the Overgreen was one of the first successful gang mowers designed from the start as an integrated unit. The Overgreen's individual mower units were based on Ransomes' successful Certes fine-cut hand machines. These were modified slightly to allow connection to and towing by the tractor unit. A pair of spoked wheels was added to each unit to enable easy transport and towing across rough areas when the mower was not in use. The Overgreen is a large and complex machine compared with many old lawn mowers. Restored examples in private collections are unusual. But Overgreens can still be seen at golf courses around the world.